Panikouli Police have arrested senior social activist Tapan Padhi from Choudwar on 17th March 2019 and severely tortured in Police station. He is in Jajpur Road sub-jail(at Ragadi). A team of activists met him on 21st March in Jail and he showed his sign of torture and you can’t imagine how inhuman police is! The case is serious. Torture is so serious, we shocked after saw that. It was a false and fabricated case at the instance of the Jajpur SP. ICC himself told that he is directed by SP to arrest Mr. Padhi. The ICC and other staff of Panikoili police station have tortured him severely in his chamber, said Tapan Padhi. They used plastic rods to hit him in the back and other parts of the body. Police have threatened him to lodge a case in Arms Act against him and encounter him. Even Police threatened him to kidnap his wife and daughter. He said all these things to the team of social activists. So, we need your support and suggestion in the matter and important is what can we do in this serious human rights violation case? 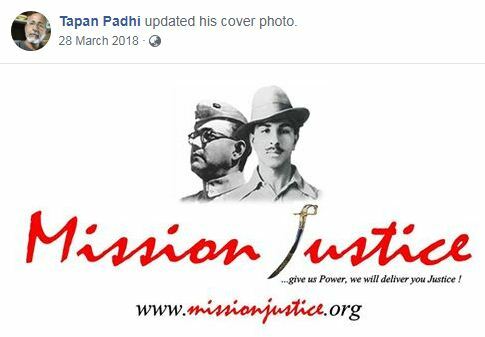 To public perception, Padhi’s attempt to register his organization ‘Mission Justice’ as a political party has provoked the fidgeting reactionaries hound him. It is now incumbent upon the Court, in the interest of justice, to ensure a medico-legal investigation into the brutal assault on Sri Padhi in Police custody and reject the prosecution if the medico-legal investigation confirms the assault. F ounder of Mission Justice Tapan Padhy is in judicial custody under allegations that the people of Orissa, in general, are not aware of. On coming to know of this, I had made a public query: whom should the State punish: those who have destroyed the essence of our constitution inscribed in the Preamble or Tapan Padhi, whose wordy fire against the system of injustice appears to some as profane? (ଯେଉଁମାନେ ଭାରତ ସମ୍ବିଧାନର ଉଦ୍ଦେଶ୍ୟିକା ଉଜାଡ଼ି ଦେଇଛନ୍ତି ସେମାନେ ଦଣ୍ଡନୀୟ କି ସେମାନଙ୍କ ପ୍ରତି ଭର୍ତ୍ସନାର ସ୍ବରରେ ଶୋଷିତର ତତଲା ନିଃଶ୍ବାସ ମିଶାଇଥିବା Tapan Padhi?) And, everybody who reacted, put his appreciation for Padhi on records and condemned the police action against him. The post was copied and circulated by some noteworthy visitors to my timeline on FaceBook. Padhi is intolerable to the corrupt and plutocratic perpetrators of misrule. 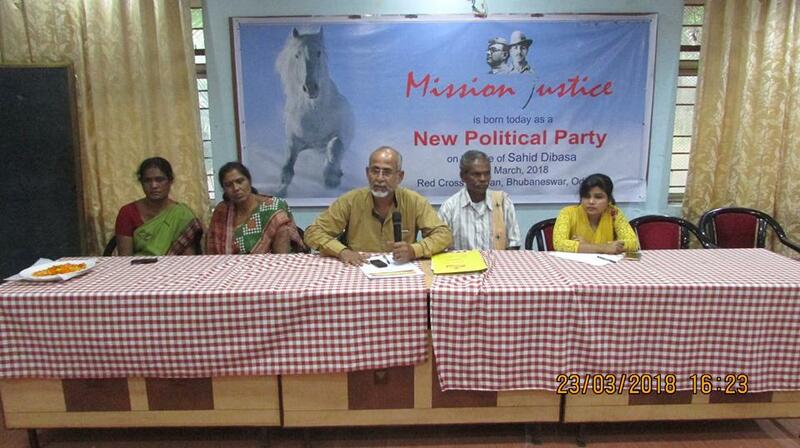 He decided to transform his ‘Mission Justice’ to a political party and has taken steps for its registration. This is why he perhaps has been framed up. The people must not be kept in the dark on his arrest. The allegations against him in their entirety need be immediately placed in the official website and every iota of action against him should be made public. Economically week persons of this Republic have the right to create their own political party and profanity on part of Padhi, if any, cannot and must not be a plea to keep him away from the people that follow him in this time of the election. On the other hand, the Supreme Court of India having nullified the Sec.66A of the IT Act, Padhi’s acrid words, if any, in social media by means of a computer or a communication device, as is reportedly the case, deserves to be viewed in terms of the apex dictum with immediate effect, so that his followers are not kept devoid of his advice and guidance at the time of the greatest exercise of democratic rights. The media in general and the TV media, in particular, need to be disciplined by the Chief Election Commission (CEC), if the election is to make any real contribution to the Democratic Republic “we the people of India” had established by our Constitution at the end of our historical freedom movement. This is because; they are obfuscating the voters with prejudiced projections of electoral prospects of parties and/or candidates that have no necessity for recovery of the ailing system. Every speculation or opinion poll is a nuisance engineered by media houses in clandestine execution of the designs of power-seekers and compradors. Name calling has become the norm of the day and sadly, the rival parties or politicians, except the Communists, are using media as their launching pad for indecorous propaganda. It is the duty of the CEC to ensure a free and fair election. If this duty is to be performed, media must have to be debarred from deforming the democracy by becoming the carriers of obfuscating designs of the power-seekers. Shrewd politicians are employing oral acrobats as panelists in TV discussions, who, having no party connection pose to be neutral debaters, but in reality are the peddlers of whosoever politician/party pay them. Long fifteen years ago I had defined the syndrome as Mediacracy. The scenario has not changed during these years. I call upon thinking Indians including the CEC to study the linked article even at this point of time to save Indian democracy from this yet-to-be-recognized mediacracy. Media must be debarred from dancing to the tune of politicians. At the time of the election, the CEC should do this minimum work to ensure that the voters are not swayed away by misleading propaganda. The media must be made to educate the people on which party and/or candidate stands for which political economy and whether or not that political economy is in tune with the purpose of our Constitution inscribed in its Preamble. This election, we call upon the Media to juxtapose the manifestoes of all the political parties with the Directive Principles of State Policy, so as to educate the voters on which party has the commitment to carry the country to where our founding fathers had wanted it to proceed. If this call is not heeded to, it would be tomorrow’s call to quash mediacracy by any means, so that the Country can survive. Founder of Bhasha Andolan, Subhas Chandra Pattanayak, who, in the aftermath of the famous ‘Fast onto Death for Language’ by poet Gajanan Mishra in July 2015, was made a Member of the Ministerial Committee to advise the Government on working of Orissa Official Language Act, has requested the State Governor to refuse approval to the amendment of Orissa Official Language Rules, 2016 on the ground that, the same is notoriously designed to add legislative correctness to the incorrect Section 4A inserted in the Act in 2018, in protest against which, the Black Flag March of the Andolan is going on. We produce below the mail of Sri Pattanayak to the Governor. Subject: Request for refusing approval to proposed Odisha Official Language (Amendment) Rules, 2019 as proposed by the cabinet in its meeting on 26.02.2019 and for termination of all legislative activities illegally committed in the matter of the said Act in 2018. The Government of Odisha had created a Ministerial Committee on working of Odisha Official Language Act, 1954 under an Official instrument vide GAD-COOD-CORDS-0013-2015-18715/GA, Dtd. 31.07.2015 to which I was nominated as a Member. I studied the issue in-depth and found that, no functionary was honoring the Act, as there was no provision therein for punishment against its contravention. I further found that, there were no Rules to administer the punishment, if any would be provided against its violation, as the Act had not given any power to the Government to create the Rules. So, I advised the Government on 03.09.2015 to amend the Act in order to equip it with penalty clause and power to create the Rule. Along with my advice, I submitted the drafts of my proposed legislation, which the Government published in the official website (bhasha.odisha.gov.in) specifically created for the purpose. The Chief Minister informed the Assembly on 14.12.2015 that the Act would be soon amended to ensure administration of Odisha in Odia. But within a couple of days, he drifted away and the Ministerial Committee was rendered inoperative. I started a movement styled Bhasha Andolan based on my method of ‘Silent Black Flag March’ for public awareness, which espoused my proposals. In the environment created by this movement, the Government amended the Act by way of an Ordinance on 21.05.2016 and thereby acquired the power to frame Rules for administration of the Act. It created a set of Rules styled Odisha Official Language Rules, 2016 vide Notification No.17601-GAD-COOD-CORDS-0090/2016/Gen., Dtd. 12.08.2016 which the Cabinet in its meeting on 26.02.2019 has resolved to amend. The proposed Odisha Official Language (Amendment) Rules, 2019, created by this resolution, has been sent to you for your kind approval. “The Odisha Official language (Second Amendment) Bill, 2018 has been passed in the thirteenth session of the fifteenth assembly and enacted in the Sixty-ninth Year of Republic of India. As per the new Section 4A of the said act, the State Government may prescribe suitable measures in the rules to award incentives to officials or Departments for extensive use of Odia as the official language and also to punish the erring officials or Departments or both. From the above, it is clear that the Government is using the occasion of amendment of the Rules to defeat the very purpose of the Odisha Official Language Act, by basing the amendment on the newly created Section 4A of the said Act. Section 4A has been mischievously linked with a superseded Cabinet Decision dated 26.12.2017. This particular resolution adopted in Odia was designed to render the original Act inconsequential. It read, the Official Language Act would be implemented as per norm and extent fixed by bureaucracy and members of bureaucracy or the departments would be rewarded for extensive use of Odia language in government work and conversely be punished for not using Odia language extensively. These provisions sharply reduced the scope and purpose of the original Act. The Odisha Official Language Act was created in 1954 by the first assembly of Odisha, elected on the basis of universal franchise. 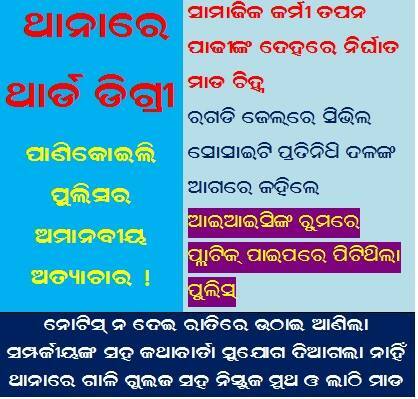 The province of Odisha was created for the sole purpose of administration in Odia only. So to fulfill the purpose, the Act stipulated that, it would be in force in the whole of the state of Odisha and for all and any official purpose in Odisha, Odia shall be the language. Thus, the cabinet proposal dated 26.12.2017, on which Section 4A was created, was to cause a sharp reduction of the scope and purpose of the Act, as it stipulated that the implementation of the Act would be limited to the norm and limit fixed by bureaucracy. In my letter dated 24.05.2018, acknowledged by your good office, I had urged upon the Honorable Governor to please refuse assent to this amendment on the grounds shown above and elaborated in the same communication. Unfortunately, that was not heeded to under mysterious circumstances. I had urged upon the Chief Minister to bring in a fresh amendment to do away with the mischief of Section 4A. But, that was also not heeded to and the illegality of Section 4A was re-enforced by a second amendment on 19.09.2018, which again was a creation of tampering of the cabinet resolution dated 26.12.2017. It is astonishing that whosoever drafted the second amendment could dare to tamper with the cabinet resolution of 26.12.2017. I elaborated the illegalities in my mail to the Honorable Governor dated 25.09.2018. But, I was kept in dark about what action the Honorable Governor took on that communication. 1. As per the review made the “Odia Language committee” under different points of time U/S 4 of the Odisha Official Language Act, 1954 irregularities in using Odia in all Official transaction have come to the knowledge of the Government. 2. Though the Act is very old Act and is in force since 1954, the provisions of the notification issued under sub-section (2) of section 2 of the said Act vide notification no. 7152-Gen., dated 29.03.1985 published in the extraordinary issue of the Odisha Gazette no. 562 dated 10.04.1985 directing all the employees and officers of the state government excepting those specified in the schedule thereto to use Odia language in all Official noting. The same is not properly implemented as there is no provision for imposing penalty against the officers and employees who are violating the provisions of the notifications under the Act. 3. Government have decided to bring the amendment immediately providing penalties for such erring officers and employees who don’t obey the directions issued under the sub-section (2) of section 2, so that they will implement the provisions of the notification in its letter and spirit. Sadly and surprisingly, this specific Resolution was buried clandestinely by the Chief Minister (Member-in-charge) and the Section 4A was created on the basis of the notorious Resolution dated 26.12.2017, which was de facto superseded by resolution dated 14.03.2018. Despite all these irregularities and illegalities, the amendment was not turned down by the Hon’ble Governor. And yet, the proposed amendment of the Rules placed before Your Honour for approval is linked to the same Section 4A which is an illegal Section, for repeal of which the silent Black Flag Movement is going on. Under the circumstances elaborated above, I request you to please refuse your approval to the same and to please review the two consecutive amendments done in the Odisha Official Language Act in 2018 and to ask the government to repeal the same/ replace the same with fresh amendment in the Act for unfailing implementation of the original Act created in 1954. And, for this act of kindness on behalf of the people of Odisha, I solemnly pray. Legends are the most misguiding mischief aimed at superimposing lies on reality so that indigenous people of an occupied land are kept too dazzled to see the dark face of the rulers and the class of exploiters can keep its victims subjugated to its authority, while forcing them to forget the heroic history of evolution of their own philosophy of life, their own splendid spiritual realizations, their own socio-economic uniqueness, their own ancient culture, their own valorous past, their own way of social integration and their own civilization. We see this mischief galore in the context of Navakalevara of SriJagannatha. So, here, we are to rip apart the legends and bring the reality of the Navakalevara to light, as thereby alone we can reach the lost uniqueness of the people of Orissa. We will use Puri Sankaracharya’s self-proclaimed authority over Navakalevara to proceed with our purpose. The Oriya daily SAMAJA founded by late Utkalmani Pandit Gopabandhu Das, to which, out of their love and reverence for the great humanitarian leader, the people of Orissa had and have been giving their financial and moral support, is in a menacing maze of forgery and loot. Sadly, two of Gopabandhu’s trusted men – Lingaraj Mishra and Radhanath Rath – who, because of being known so, had the opportunity of becoming cabinet ministers in Orissa, were the masterminds and/or makers of the forgery from which the paper is yet to be salvaged.